By AGENCE FRANCE PRESSE, Dubai, United Arab Emirates, Nov 15 – Emirates Airline on Thursday posted an 86 percent drop in half-year profits as the Middle East’s leading carrier was hit by a hike in oil prices and currency devaluations. The Dubai-based airline in a statement its net profit in the six months to September 30 was also impacted by other challenges and expected tough months ahead. Emirates said it recorded a profit of just $62 million in the first half of the 2018-2019 fiscal year compared with $452 million in the same period last year. “The high fuel cost as well as currency devaluations in markets like India, Brazil, Angola and Iran, wiped approximately 4.6 billion dirhams ($1.25 billion) from our profits,” said Sheikh Ahmed bin Saeed Al-Maktoum, chairman and chief executive of Emirates Group. Emirates, one of the world’s biggest airlines, said fuel costs rose by 42 percent compared with the same period last year. The company, which flies to more than 150 destinations, said the cost of fuel amounted to a third of its expenses. Emirates is the world’s largest operator of Airbus A380s with more than 100 of the superjumbos in its fleet. “The next six months will be tough, but the Emirates Group’s foundations remain strong,” Sheikh Ahmed said in a statement. In the six months to September 30, the airline carried 30.1 million passengers, a rise of three percent on the last fiscal year, the company said. 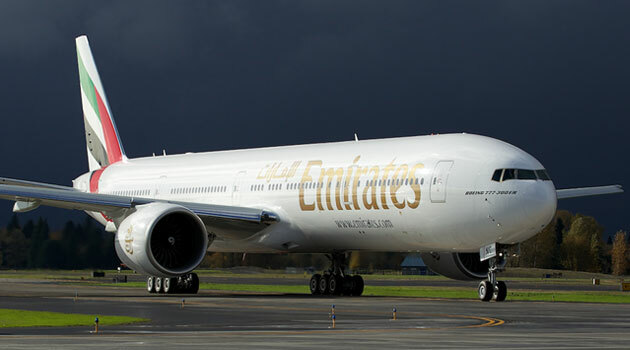 Emirates’ revenues were 10 percent higher than the previous year at $13.3 billion. “We are proactively managing the myriad challenges faced by the airline and travel industry, including the relentless downward pressure on yields and uncertain economic and political realities in our region and in other parts of the world,” said Sheikh Ahmed. Profit for the Emirates Group, which also includes Dnata, a leading air services provider, was also down by 53 percent to $296 million.